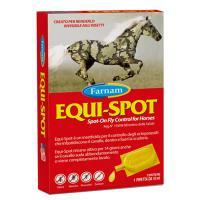 Set 2 Farnam Equi-Spot, insect repellent for horses. Innovative system to protect the horse from insects and external parasites such as mosquitoes, gnats, flies, horseflies. In convenient disposable pipettes Spot-On 10 ml (10 drops), easy to use and dose on the body of the horse. They have the same principle as those that are commonly used for dog and cat. In fact, the Permethrin has low toxicity and has very rare cases of allergic reaction in horses. Its innovative formula that is deposited in the skin, it remains active for 14 days, protecting the horse in and out of the stable, resisting sun, rain, shower and intense sweating. Equi-Spot The package contains 6 pipettes of 10 ml each.